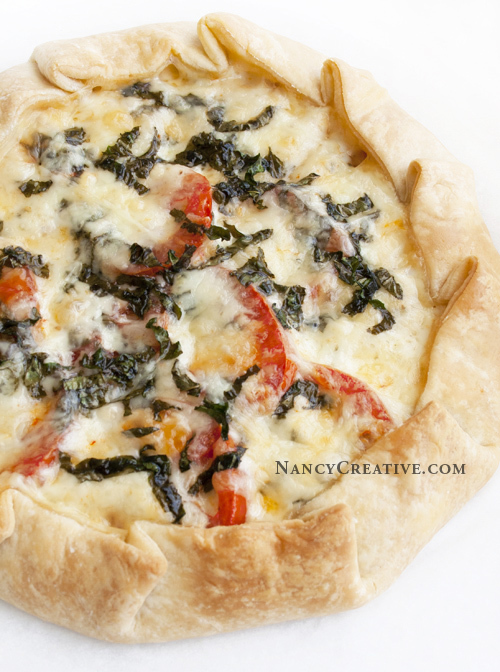 If you like Caprese Salad or Margherita Pizza, you’ll want to try this tart! 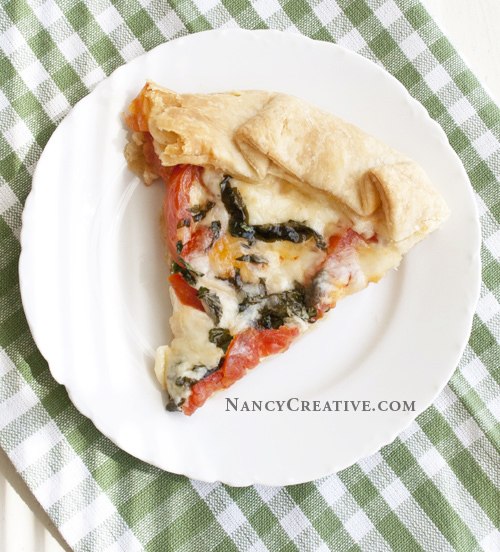 It has sliced mozzarella, tomatoes, and basil in it–yum! This summer, I’ve been wanting to make some sort of a tomato tart and I came up with the idea of making a Caprese Tart! If tomatoes, basil, and mozzarella are so good in a salad or on pizza, they’d probably be good in a tart, too, I reasoned. And you never know until you try. I have some basil growing in a pot and also had some garden-fresh tomatoes (from Mark and Marijo–thank you!) , so I bought a block of mozzarella cheese and was all set to try this out! I thought it turned out really yummy and it’s very easy to make–I used a pre-made refrigerated pie crust, but you can use your favorite homemade pie crust recipe if you prefer. I also used a little Parmesan cheese in this, to give it a little extra cheesy zing. If you’re looking for ways to use the tomatoes from your garden, you just may want to try this Caprese Tart out! Preheat oven to 375 degrees F. Line a baking sheet with parchment paper, and lightly coat parchment paper with cooking spray. Toss the shredded Mozzarella and Parmesan cheeses together in a small bowl so they’re blended well. Unroll pie crust on parchment-lined baking sheet and top crust with half of the cheese blend (1 cup), leaving a 1 1/2-inch border at the edge. 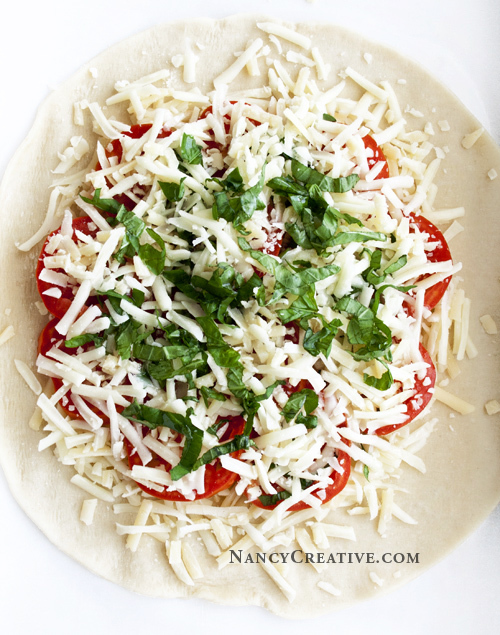 Arrange tomato slices in a circular pattern over the cheese (you may need to overlap some of the slices a little). Sprinkle half of the chopped fresh basil over the tomatoes, then drizzle with 1 Tablespoon of olive oil. Spread the rest of the cheese (another cup) over the tomatoes and basil, then sprinkle the remaining basil on top of the cheese and drizzle another Tablespoon of olive oil over that. Remove from oven and let tart cool for 10-15 minutes before cutting into wedges, then serve. 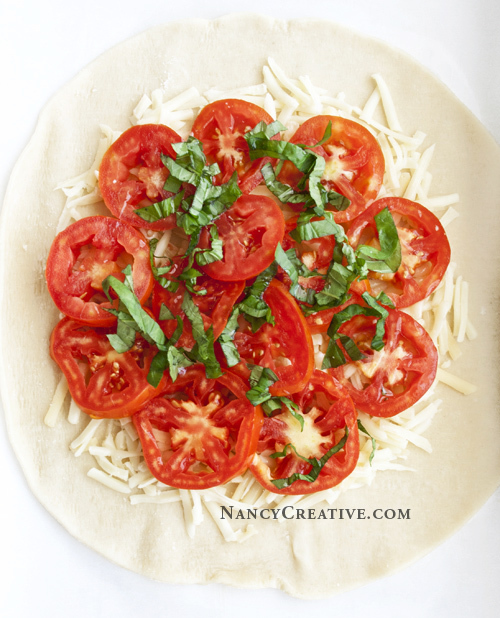 I love to make things with basil and tomatoes, especially in the summer! Do you have a favorite tomato and basil recipe? This entry was posted in Breakfast/Brunch, Food and Recipes, Main Dishes, Summer/Summer Holidays and tagged baking, brunch, Everyday, mozzarella, olive oil, tomatoes on July 31, 2012 by nancyc. I haven’t ever made my own Mozzarella, but that would be fun to try! Let me know how it turns out for you if you try it, Michelle! Did you fold up the edges and pinch them before baking? I didn’t see where it said that in the recipe, but it looks like that’s what you did? Yes, I did do that–I’ll add that in. Thanks for catching that, Patti! 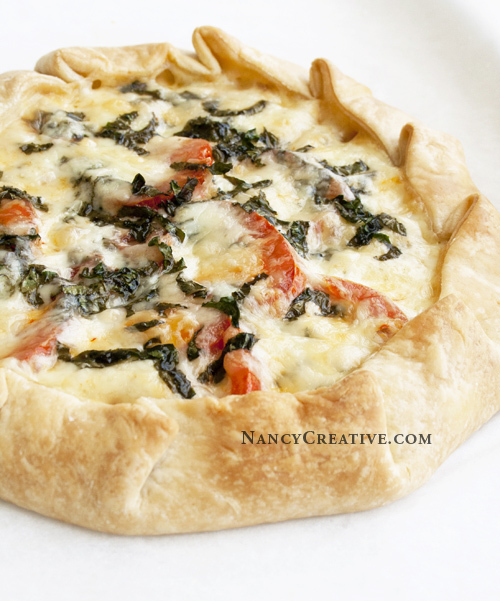 My favourite salad in a tart shell – perfect! Yum! I want this now! 🙂 definitely making this soon thanks! Oh, I will make this!